Graphika creates dynamic maps of network relationships to reveal deep insights into social influence for content planning and audience engagement. Its client list includes documentary filmmakers interested in certain aspects of online market research and national broadcasters such as ESPN. DV Info Net guest contributor Madeline Ward interviews CEO John Kelly about his company’s first experience at NAB2018 and Graphika’s role in monitoring, mapping and analyzing the social media landscape. The interview was conducted at Graphika’s office in Manhattan about a month after NAB2018. Previously, in Feb. 2017, ESPN had hired Graphika to sift through more than five million tweets during an internal investigation of some suspected fraudulent activity during its online All-Star voting process. During the process, numerous fake accounts were found that directly influenced the voting results. Graphika’s analysis was also able to delineate various sources responsible for generating an unusually high number of votes for a particular NBA player, Kawhi Leonard, who was at that time with the San Antonio Spurs. 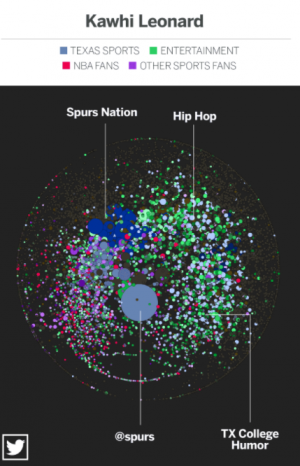 The voting activity map generated by Graphika revealed that results for Leonard were coming from far outside the Spur’s own fan base, including several hyper-active bots that were voting around around a thousand times per day. For more details about this process, read ESPN’s full article “Zaza Pachulia, Justin Bieber, Macedonian Twitter bots and the insanity of NBA All-Star voting” by Baxter Holmes from 16 Feb. 2017. In just a very short time during its recent history, Graphika has transitioned from the relatively innocuous work it has done for documentary filmmakers to a more serious role of tracking and analyzing political disinformation campaigns, including what Kelly describes as “clear evidence of coordinated manipulation” in Paul Lewis and Erin McCormick’s article “How An Ex-YouTube Insider Investigated Its Secret Algorithm”, which is a follow-up to The Guardian’s “Fiction Is Outperforming Reality: How YouTube’s Algorithm Distorts Truth” from 2 Feb. 2018. Graphika continues to identify the key influencers in the social media sphere. While 2018 was the company’s first year to exhibit at NAB, it constantly maintains a discerning watchful eye on the patterns that shape today’s constantly changing cyber-geography. Maddie has worked in social media advertising since the early days of Facebook like campaigns and Twitter character limits. As a the social media lead for a major animal non-profit, she helped save thousands of cats and dogs as part of a team. That cute viral content reached millions of people and was featured in places like the Atlantic Monthly, New York Times and BuzzFeed. After being in the hotbed of influencer marketing and the witnessing rise of Instagram, she switched gears to work in the fashion industry. She provides social media strategy consulting for anything digital media related. She is currently pursuing a passionate side-hustle in fiction podcasting. She lives in Manhattan and excited to be a firsthand witness to the revolution coming to digital media.